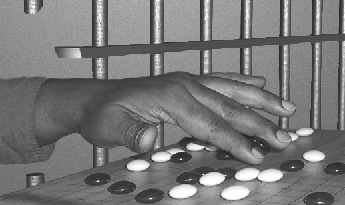 “I am 14 years into a 25 year sentence, and I am interested in starting a go club at the prison,” read the letter from K, forwarded to me at the American Go Foundation by Mark Rubenstein at AGA Member Services. Although our main work at the AGF focuses on children, we also offer full support for institutional settings as well. I sent K an information packet and an application for a class room starter set. Noticing the prison was here in Colorado, I also told him I would be willing to do a demonstration at the prison. 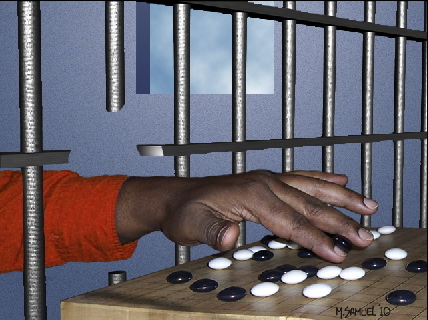 Rubenstein also donated two playing sets, and a number of go magazines, but the package was refused by the prison, which had very specific guidelines about what they would accept. As K had mentioned wanting to start a program at the prison, I thought I might try contacting the education coordinator at the prison directly. So began the first of what would ultimately be six months worth of phone calls, letters, and requests to the Federal Correctional Institute in Englewood. I had given up on any chance of a program starting at the prison when I finally received a phone call from one of the education coordinators. He said he had a group of over 20 prisoners who kept asking him when the go teacher was going to come, so he finally decided to let me do a demonstration at the prison. I was also able to arrange for the prison to accept multiple playing sets for the program, and I was finally able to hand-deliver Rubenstei n’s package of equipment and magazines as well. I wasn’t sure what to expect when I finally went to the prison. I had briefly worked with youth in a juvenile correctional facility a few years back, but Englewood is an adult prison, and a federal one at that. When I arrived, I was surprised at the size of the place. A guard told me they house 1,000 inmates there. I passed through multiple security screening points, with giant sliding metal grates, and went deep into the heart of the complex, where I was taken to an educational center in the prison and had a few minutes to set up before the 22 prisoners who had signed up for the program arrived. I finally met K in person, who thanked me profusely for arranging the demonstration. He and the other inmates were all polite, friendly, and very attentive. Three of the prisoners knew how to play already, and I was very pleased to see that they had a few volumes of Janice Kim’s Learn to Play series. None of them had ever played a game outside of the prison system though. The other 19 inmates were all first-timers, so I taught them how to play and then had them all play each other on 9×9 boards. I think the Education Coordinator was pleased to see all of the inmates immediately engaged in the game, and laughing as they discovered new things. After they had all played a game or two, I offered to do a simul with any five of them. They were quite excited by this, and everyone else gathered around the table where I was playing. I gave most of them a five stone handicap on the 9×9, and tried to show them some things while we were playing. One of the men, T, had been playing for many years. He told me he had learned from a Japanese prisoner, at another prison. He had tried to show the others how to play, but hadn’t had too much luck. I played him even on the 9×9, and the other inmates all took immense pleasure in finally seeing T lose a game. 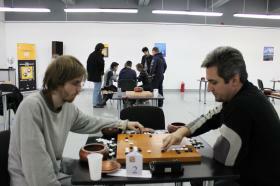 After the first simul, I did a second one. This time I played both K and T on the 19×19 with a 9 stone handicap, and three newcomers on the 9×9 boards. Knowing that I wouldn’t be able to come back often (or perhaps at all) I wanted very much to see if we could establish a rank for either of them. K thought he might be 17 kyu, T had no idea, but they both knew he was much stronger. T played a good game, and to our mutual delight, was able to force me to resign. Since he was within 9 stones of my rank of 1 kyu, I told him I thought he was about 9 kyu. I explained that each handicap stone was worth roughly ten points, and that from here on out he should try to give handicaps accordingly to the other inmates. If he won a game by 50 points, he should give five stones, and so forth. Hopefully the other players will be able to base their ranks off of his. 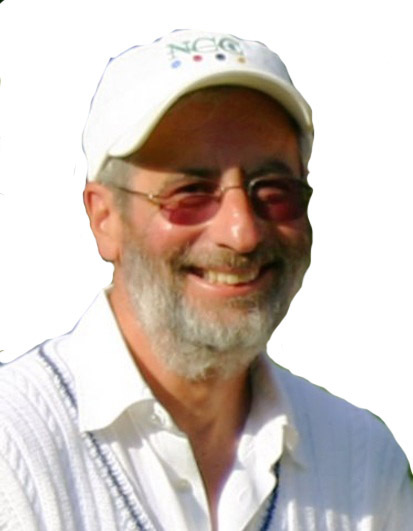 My experience with many clubs has been that two things are critical for success: first, a group of beginners who are all learning together, and second, a handicap system that allows everyone to play fair games. At the end of my three hours with the inmates, T surprised me by asking if it was possible to make a donation to the AGF. I told him we were funded entirely by donations, and would welcome one if he had the ability to give. I wasn’t expecting the prisoners to have any money, but one of the guards explained that the inmates work in the prison, and receive wages for it. I don’t know what crimes any of these men had committed, but I do know that a person doesn’t stop living once they are behind bars. I can think of no group that might better benefit from the qualities that go brings to our lives than prisoners. Perhaps learning how to play go will give them a non-violent forum to express themselves in, and they will be able to better themselves by learning how to communicate in this way. 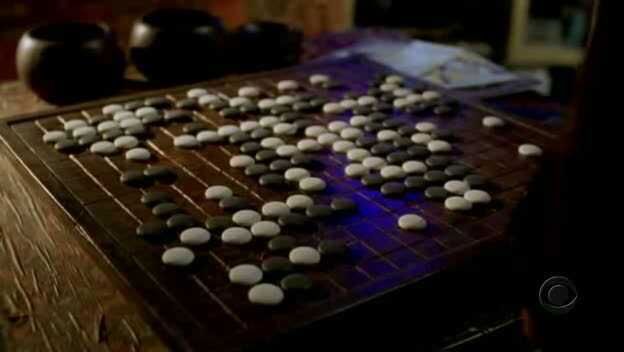 I also know that whatever a man’s crime, he should be able to play go if he wants to. They have chess and Scrabble in prison, they should have go too. A number of readers recently tipped us off to go showing up in the Criminal Minds television series. A police procedural drama focusing on the criminal rather than the crime itself, Criminal Minds — which premiered in 2005 — featured go in the pilot. Screen grab from the “Extreme Aggressor” episode courtesy James G. McIlhargey. 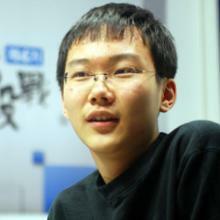 HU WINS CHI TOURNEY: Thomas Hu 6d won the January 23 “The White and the Black” tournament in Chicago, IL. “A smallish tournament, but some great games,” reports TD Bob Barber. 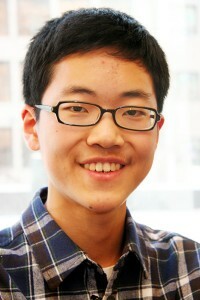 “A new player was Young Rhee 7d, who will be teaching at the brand new Go Center in nearby Arlington Heights. If we move the tourney, we may double attendance. Heady times in Chicago.” 26 players participated. Results: 1st Place Dan: HU, Thomas, 6d, 4-0; 1st Place High Kyu: RUBENSTEIN, Mark, 4k, 4-0; 1st Place Low Kyu: ZHANG, Chris, 33k, 4-0. JUJO TOURNEY REPORT: Mingjiu Jiang 7P won the Jujo Jiang Ing Goe Tournament held January 9-10 in San Francisco, CA. Winner’s Report: 1st place: Mingjiu Jiang 7P (5-0); 2nd: Calvin Sun 7d (4-1); 3rd: Lu Wang 7d (3-2); 4th: Song Li 6d (3-2). METTA TAKES TROFEO: Carlo Metta 1d (Pisa) won the 5th Trofeo Higashitika held January 16-17 in Remanzacco, in the Udine province in northeast Italy. Metta won his first four and drew his last game with Sandro Poldrugo 1k (Triest), who finished second. Radovan Golja 3d (Ljubljana – Slovenia) 3-2 finished 3rd in a field of 22. Only Frederico Forte 16k (Pisa) won all five rounds. Click here for results. BELFAST PLAYERS DOMINATE IRISH CHAMPIONSHIP WEEKENDER: Two players from Belfast dominated the first weekend of the Irish Championship League, held January 16-17 in Dublin. Winning all four games were defending champion Ian Davis 1d and newcomer James Hutchinson 1k. In second place were John Gibson 1k and Eoghan Barry 3k. With three games each left to play “anything could still happen in the race for the final,” says Davis. Click here for latest results. 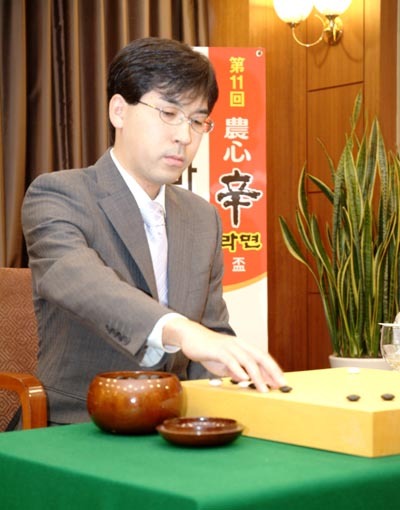 XIE HE WINS THE FIRST ROUND IN THE NONGSHIM CUP: China’s Xie He 7P defeated Japan’s Iyama Yuta 9P by resignation in the first round of the 11th Nongshim Cup. 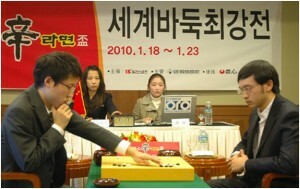 This is the second stage of the three-stage tournament, a team competition between Korea, China, and Japan. As players from each team lose, they are eliminated from competition until no other opponents remain. Korea has dominated this competition since it started in 2000, winning 8 out of 10 Nongshim Cups. PAL BALOGH LEADS PANDANET RANKINGS: Pal Balogh leads the current Pandanet rankings at January 1 with 55 points from five tournaments. In the top ten, players from Central Europe dominate: Ondrej Silt with 41 points (5, CZ), Christian Pop 37 (3, RO), Mero Csaba 36 (4, HU), Nikola Mitic 33 (4, RS) and Jan Simara 30 (4, CZ). Young Vanessa Wong (UK) shares 7th with veteran Vladimir Danek (CZ) 17 and Herman Hiddema (NL) shared 9th with Zou Jin (DE) 15. The Pandanet season runs until Easter, closing with the Paris Open, which leaves just four events to go. Click here for the full table. 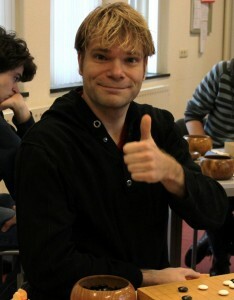 TERWEY TAKES ESSEN: Matthis Terwey 4D (l in photo at right) of Münster won in Essen on SOS in the opener of the year January 9-10 in Germany, ahead of Lukas Krämer 4D (Bonn), who defeated him in the last round. Despite the snow, a field of 79 turned out. Only Ingmar Schwarz 3k of Dortmund went undefeated 5-0. Click here for results. FLORESCU WINS JUBILEE JAC IN BUCHAREST: Ion Florescu 6d edged out Cornel Burzo 6d and Cristian Pop 7d in the December 11-12 Japanese Ambassador Cup, held in Bucharest’s National Theatre. All three are from Romania and were former insei in Japan. The special event was organized to celebrate the jubilee anniversary of relations with Japan. Although this year the event was open to foreign guests, just a handful participated, including three Hungarians –Csaba Mero 6d finished fourth with 4-2 and Pal Balogh 6d fifth with 3-3 — two Greek, one Dutch, French and Swiss in the field of 135. A detailed report with videos is available in the news archive (dated Fri 11 Dec) on EuroGoTv.com. Click here for results. photo: winner Ion Florescu (r) with Pal Balogh; photo by Judith van Dam. FAN SWEEPS LILLE PANDANET: Fan Hui 8d comfortably swept the Pandanet in Lille December 12-13. Female players dominated the rest of the podium, with Li Ting 6d from Vienna (Austria) losing only to him and French Champion Zhang Yanqi to them both. French Youth Champ Thomas Debarre 5d lost to the top three to finish fourth. From the best seven, only young (14y) Vanessa Wong (4d, 6th) didn’t meet Fan. Local hero Lucien Laks 2d had the honor to face Fan for his last game. Despite excellent high-speed rail connections to both Belgium and London, only a few foreigners were among the 75 participants: a handful of Belgians and 2 Brits (Vanessa and her family-member Julius 2d). In Lille many did well with 4-1, but only Sylvain Benesteau 11k (Paris) and local Xavier Seguin 18k remained undefeated in all five rounds. Click here for results. CORRECTION: The MoGo games were held in Cadiz, southern Spain, not Barcelona, as reported last week. Thanks to Gregorio Morales, Spanish Go Association (AEGO) member and former President, for the catch.